Albertson house, Gloucester Township, New Jersey. Details, fireplace wall. Sheet 9 of 10. These are surviving architectural woodwork and hardware details from the house's original construction in the mid-1700's. 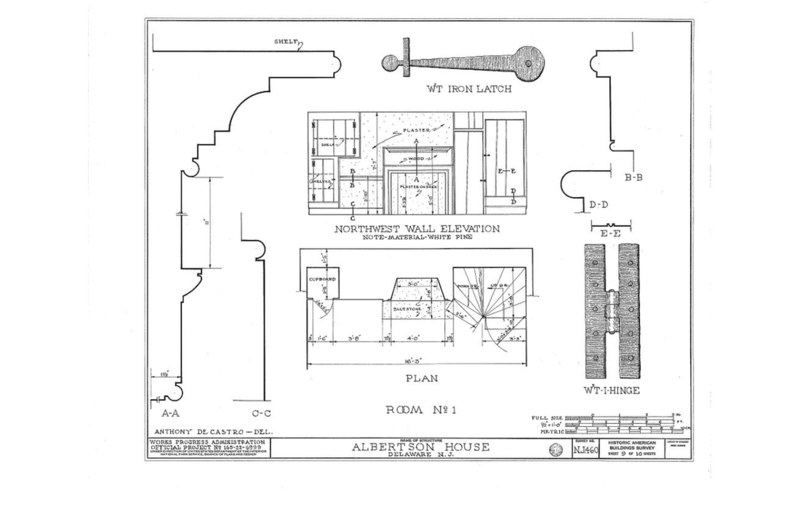 Historic American Building Survey. People, Programs and Resources for New Jersey's Heritage...New Jersey's Historic Preservation Office, located within the Department of Environmental Protection, brings expertise in a variety of fields essential to preserving historic resources. We count among our staff historians, researchers, planners, architectural historians, architects, engineers, and archaeologists. We respond to more than 40,000 calls yearly from people working to preserve, protect and promote New Jersey's historic resources. ﻿The officer of the New Jersey Historic Preservation Officer is located in the New Jersey Historic Preservation Office. ​The New Jersey Comprehensive Statewide Historic Preservation Plan is a new 2013-2019 plan developed by the NJ Historic Preservation Office (HPO) and Preservation New Jersey. This plan is intended to guide not only the HPO, but also to provide direction to state, county, and local governments, private organizations, and individuals in their efforts to protect and to preserve New Jersey’s rich and diverse history. ​In November 2014, New Jersey voters approved a change to the state constitution to provide a stable source of funding for open space and historic preservation by dedicating funds from the Corporate Business Tax. Capital preservation grants may be used for construction expenses related to the preservation, restoration, repair, and rehabilitation of historic property and professional fees necessary to prepare and complete the construction project. All proposed projects should be supported by previous investigations, such as preservation plans or assessments. Eligible applicants must be nonprofit organizations or units of county or municipal government. Eligible properties must be listed on the New Jersey Register of Historic Places by December 31, 2015. The the 1772 Foundation, in cooperation with the New Jersey Historic Trust, offers Capital Preservation Grants, up to $15,000, available to nonprofit organizations for repair and restoration projects. The grants require a one-to-one match from the grant recipient. Eligible applicants must have a 501(c)3 IRS designation. Schools and religious congregations are not eligible to apply. Eligible activites include: exterior painting, finishes and surface restoration; fire detection, lightning protection and security systems; porch, roof and window repair/restoration; structural foundation and sill repair/replacement; and chimney and masonry repointing. Founded in 1978, Preservation New Jersey advocates for and promotes historic preservation as a sustainable strategy to protect and enhance the vitality and heritage of New Jersey’s richly diverse communities. PNJ is the only statewide private membership-supported historic preservation organization in New Jersey. The New Jersey Historical Society is a state-wide, private, non profit historical museum, library, and archives dedicated to collecting, preserving, and interpreting the rich and intricate political, social, cultural and economic history of New Jersey to the broadest possible audiences. Founded in 1845, we are the oldest cultural institution in the state. Through exhibitions, publications, and programming, we examine who and what we are, what it means to live and work in New Jersey, what contributes to New Jersey's distinct identity, and what are the unique contributions New Jerseyans make to the region and the country. The HPC is a seven-member commission of the City of Cape May, established under the Municipal Land Use Law of New Jersey and appointed by the Mayor. The board is charged with working with and advising the City Council, The Planning Board, the Zoning Board of Adjustment and the Construction Official. The HPC’s responsibilities include considering the appropriateness of new development, external modifications to existing structures and any demolition within the Historic District. It also conducts surveys of buildings and sites within the Historic Landmark District and recommends the designation of Historic Districts, buildings and sites to the Cape May City Council. ​Much of the municipality’s development took place during the Colonial period, and the Victorian architecture is still very visible throughout the municipality and surrounding areas. West Cape May was incorporated as a borough by an Act of the NJ Legislature on April 1, 1884, from portions of Lower Township. The historic core of the Borough was placed on the National Register of Historic Places along with sections of the City of Cape May in 1976, making West Cape May a part of both the National and State Register of Historic Places. n. To request the City Council to seek on its motion or otherwise injunctive relief for violations of the historic preservation provisions of the local zoning ordinate. Image: Stick style design, U.S. Coast Guard Station, Cape May, New Jersey, 1887. The architectural term 'Stick Stlye' was coined by Antoinette F. Downing and Vincent J. Scully in their superb archiectural history, 'The Architecturtal Heritage of Newport, Rhode Island.' In this work they theorized that the taught exterior, and sometimes interior stick decoration (It was rarly structural) grew out of an expression of the baloon framed walls underneath. The diagonal, rectangular and horizontal siding and stickwork also drew insriration from a relatively rare architectural revival style, the 'Swiss Cottage' of which few examples remain. Most of the Victorian era Coast Guard Stations exhibit spectacular stick decoration, where the verticle, diagonal and horizontal sticks frame the exterior openings, visually anchoring them to the walls. Side elevation, Drawing, Historic American Building Survey. The Historical Preservation Society Of Upper Township, NJ, Inc. Image: Stick style U.S. Coast Guard Station, 1887. Photograph, Historic American Building Survey. In an effort to protect Newark’s architectural and historic heritage, individual buildings and larger districts have been designated as historic, and may be placed on the local, state and national register of historic places. Owners of these properties have certain preservation and upkeep responsibilities. The Historic Preservation Commission (HPC) is a local review agency of Princeton. Its purpose is to promote historic preservation, recommend designation of historic properties and review projects for development in locally designated historic districts in Princeton. The Commission is a citizen body appointed by Township Committee whose members serve without pay. Its members have a range of knowledge of architecture, architectural history, landscape design and archaeology. The mission of Middlesex County Office of Culture and Heritage is to develop county wide programs and promote public interest in local and county history, in the arts, and in the cultural values, goals, traditions of the community, the State and the Nation. The enabling legislation establishes a Commission​ to serve in an advisory capacity. The Office undertakes the restoration, operation, maintenance and preservation of real property acquired by the County. The Office is authorized to establish museum and cultural programs, exhibits and displays including the fine and performing arts, engage in archaeological, genealogical and historic research, publish reports and engage in activities to promote and develop public interest and understanding of historic and cultural matters. Board of the inclusion of historic sites in the recommended improvement program. There shall be a Middletown Historic Commission established as an advisory body to the Township Committee for the purpose of fostering awareness and appreciation of the township's rich history, to advance public knowledge of Middletown history through outreach and education, to advise the Township Committee and Landmarks Commission with respect to nominating properties for historic recognition, and to encourage the growth of historic tourism within the township. The Commission shall further be dedicated to the collection, preservation, restoration, exhibition and archiving of artifacts and documents related to the founding and continuing evolution of the Township of Middletown as one of the earliest colonial settlements in New Jersey. The Commission may assist and advise the township with respect to applications for grants, gifts or donations for such purposes. The mission of the Open Space Trust Fund is to assist in the execution of policy made by the Union County Board of Chosen Freeholders to conserve open space, provide recreational opportunities, and to preserve historic sites. When the Trust Fund was created by referendum in November of 2000, the voters of Union County indicated their strong commitment to all three aspects of this initiative: acquisition of open space, expansion of recreational opportunities, and preservation of historic properties in Union County. This office works diligently to assist the Freeholder Board in providing direction in each area, and as a result the residents of this county continue to see ever expanding benefits in all areas. The Historical Society of Elizabeth seeks to preserve and research Elizabeth, New Jersey’s rich history. We document the people, places and events that shape our past, exploring the social, political and economic life of Elizabeth through the 20th century and beyond.